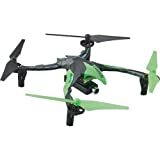 Dromida Ominus Drone Review 2019 – is the Dromida Ominus quadcopter worth the money? Review of features, pricing, flight duration, battery, camera and more. Built to bounce back from hard landings and everyday impacts. Refer user manual below. Bright, colored LEDs help you orient in the air and track day or night. Auto-Flip function flips your quad with a simple radio button-push. The 21st century has seen a number of innovative technological advancements. The Dromida ominus drone happens to be one of the new gadgets in the drone market. Apart from the versatility and the eye-catching design, the quadcopter comes with an array of features that are bound to impress. Here is a review of Dromida ominus Drone. The device comes shipped in a sturdy metal box with distinct compartments. Inside the compartments, you will get the drone, a set of spare propellers, a screwdriver, a comprehensive user manual and a set of AAA batteries to power the controller. The user manual of this particular drone is quite detailed. It has very elaborate illustrations of the controls, the various panels and a detailed explanation of how the various modes of work. The designers of this drone went the extra mile as far as built quality is conserved. The drone’s exterior framework consists of a sturdy metal frame for the body. For navigation, the drone relies on software and sensors that run the drone’s stabilization feature. According to the official Dromida ominius website, the drone can survive various obstacles such as hitting a fence during flight, being run over by a bite and even chewing by a dog. Considering the amount, one pays for the device, being assured your drone will survive accidents is something buyers will highly appreciate. Even though the flight time is stipulated as 15mins, This depends on a variety of factors such as the wind speed and the general nature of the flight. Putting all factors into consideration, the average flight time is therefore 8-12minutes. The recharge time for the battery is about 45 minutes. The Dromida ominus incorporates the latest software features when it comes to the control panel. The control panel is powered up by 4 AA batteries. One can operate the Drone using 2 basic modes either in the high or low mode. The high mode increases the agility of the drone giving you the freedom to do more aggressive maneuvers such as flip-flops. The low mode, on the other hand, reduces the drone’s agility in flight. One can also switch off the expert mode. When the expert mode is not in operations, the accelerometer is turned off giving you more room to perform manual stunts. The drone has an elaborate notification system comprising of LED lights. A notification LED constantly blinks form 30 seconds before the battery completely runs out. When one turns off various modes such as expert, the notification LED also blinks alerting one of the changes. This is one of the drones that is bound to give you a very smooth flight experience. The drone is fast, very responsive, and can do various stunts. The drone can comfortably do lips midair by just the press of a button. It is even possible to fly the drone upside down if one feels like. For a smooth flight, the drone relies on an advanced system comprising of gyroscopes and accelerometers. The drone’s agility, impressive speed and stunt capabilities will definitely make flying the drone fun and memorable. The body is made up of high-quality material. The drone appears very sleek. It can carry out various stunts and is quite fast. • The drone can be flown both outdoors and indoors. • The drone comes ready to fly out of the box. The drone wobbles a bit after a flip due to a lag in response. The drones throttle feels like it Is slightly underpowered. Compared to other drones in the market such as the Dromida vista, the drone has a shorter span and even weighs less. Unlike models such as the DJI Mavic 2 pro and the Dromida FPV, the drone lacks camera support. The build quality of this particular drone makes it stand out from the rest. The drone can survive crashes without any major damage apart from a few scratches. The battery capacity and recharge time of this particular drone are quite impressive compared to that of other drones in the market. 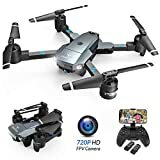 Customers who have purchased the drone make countless reviews. 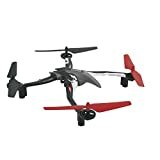 Based on these reviews, it is clearly one of the best drones you will find in the market in the 50$-100$ category. 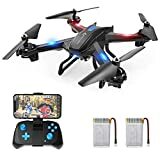 Described as a “the unstoppable robotic menace for other quads” by one of the drone review websites, the drone packs some of the latest technological features. Most users recommend it as the ideal beginner’s drone. The control panel design makes it easy to operate the drone. Users have also expressed satisfaction with the flight time as it is within the range of most other drones in the price category. The focus of most of the customer reviews is however on the build quality and stunt capabilities. Customers hail the device as having one of the best build qualities as it is made up of high-quality material. The fact that it can survive usual crashes and perform various stunts is a major selling point for most customers. Customers have however expressed displeasure in the fact that the drone lacks any camera support. This is particularly frustrating to most clients. Having a camera according to most customers would have not only made navigation easier but the whole experience of operating the drone more thrilling. Even with the flaws, the designers of this particular drone did a remarkable job. 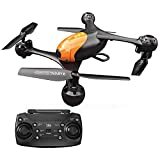 Priced at around 80$ in most of the major drone stores, one is able to get a versatile drone with an array of features and stunt capabilities. Whether one is a beginner or not, the drone is bound to impress making it a very worthy purchase.